As one who has written the occassional, modest battle report, I'm always keen to study the work of a master storyteller and brush up on my technique, especially when the cover of said read has a picture of stalwart chaps in putees and foriegn service helmets stoutly defending their Beloved Colour....Coorr I'm going all misty eyed with fervent Patriotism. I considered putting the book to one side till I'd managed to purchased part 1 & 2 of the Trilogy but frankly the book and its wonderful cover was practically screaming at me to read it so I gave in. The novel recounts the exploits and tribulations of Brigadier General Anthony Morgan on active service in the Helmand Valley, Afghanistan, 1880. In particular it recounts his experiences at the Battle of Maiwand, the subsequent retreat and the final victory against Ayoob Khan at Kandahar. The main characters are the Brigadier General and his two sons Sam & Billy who happen to be serving officers in different Regiments under his command, the 3rd Scinde Horse and the 66th (Berkshire) Regt. The book tells the story in the first person from the three main characters perspective and at times I found it a trifle confusing as to who was doing the talking as it tends to jump from one to the other but as the I got to know the characters this quickly became less of an issue. I found the book a great read, especially the battle scenes. 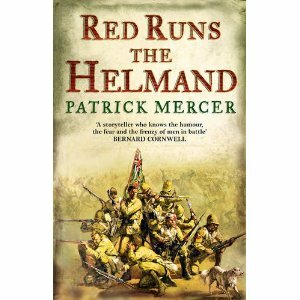 The author, Patrick Mercer, has definitely captured the humour, the fear and the frenzy of men in battle as Bernard Cornwell's endorsement states on the book cover. The book is populated with wonderful characters such as Major Alan 'Jock' McGucken, Sergeant Kelly, Private Battle, Private 'Posh' Williams and even 'Bobby' the terrier and Regimental Mascot of the 66th. These last four actually existed so the book closely resembles fact and is not some fairy story about a rogue who always manages to find some swooney eyed bint with a heaving bosom to rescue whilst single-handedly thwarting the plans of a whole opposing Army...not that I have anything against swooney eyed bints with heaving bosoms, just not when there's serious fightin' to be done f'gawdsake!! Patrick Mercer,The Author, a retired Colonel in the British Army and current MP, draws a remarkable parrallel to the conditions faced back then and the current situation that Her Majesties Armed Forces encounter on a day to day basis in Afghanistan. Still the relentless heat, the difficult country and a determined and uncompromising adversary. For anyone about to embark on a spot of wargame campaigning against the wild and wily Tribesmen of the North West Frontier this is a must read. the book is practically brimming with ideas for scenarios such as patrols, seiges, rearguard actions and full scale battles not to mention those wonderful characters. Well done and thank you Mr Mercer...looking forward to going back to the beginning with novels 1 and 2, albeit out of sequence. Great report there Gav. Might have to borrow the book from you. Sounds excellent, will see if a mate has it. It sounds good. Thanks for the recommendation. I'll look out for it.